40th Anniversary reissue of Jerry Garcia’s fourth solo studio record and the first to be presented as the Jerry Garcia Band which included Garcia, John Kahn, Ron Tutt and Garcia’s Grateful Dead bandmates, Keith & Donna Godchaux. Cats Under the Stars presented all new repertoire including the Garcia-Hunter penned favorites "Rubin and Cherise", “Gomorrah", "Palm Sunday", and the album’s title track. 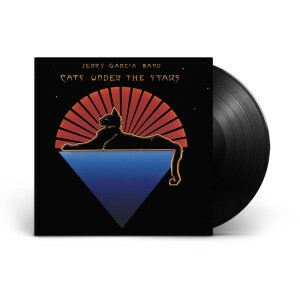 Garcia considered Cats Under the Stars to be his favorite of his albums commenting “That’s the one that I’m happiest with, from every point of view in which I operate on that record." The 2017 vinyl reissue features re-mastered audio by Fred Kevorkian with lacquers cut by Ron McMaster at Capitol Studios and pressed to 180-gram black vinyl by Quality Record Pressings.